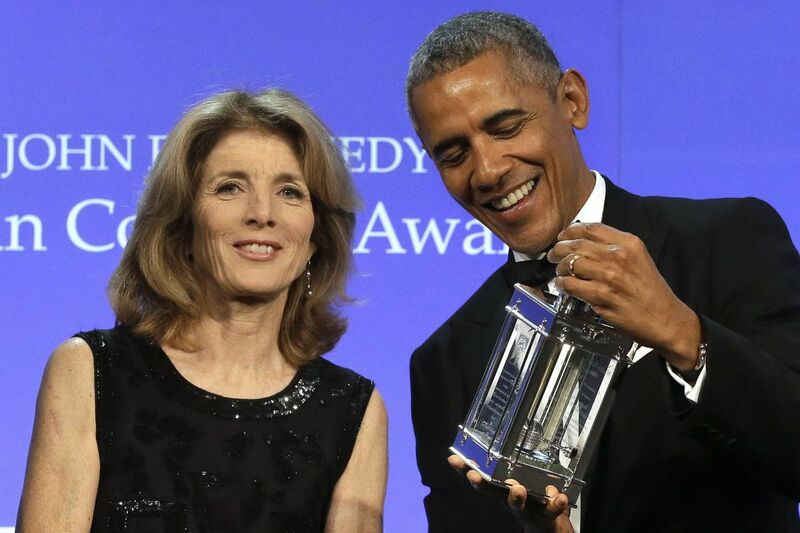 The Paris climate accord was signed during the administration of President Barack Obama, shown here accepting the 2017 Profile in Courage award from Caroline Kennedy at the John F. Kennedy Presidential Library and Museum on May 7. The Paris climate agreement, signed during the Obama administration, was heralded by many as a major win for global climate action. It attempted to include the entire world and managed to amass 195 signatories. Given that international climate negotiations are notoriously difficult, that can only be evidence of two things: Either the agreement was a truly monumental one in which the entire world came together to respond effectively to a global problem or it was so toothless that nobody bothered to object. All things considered, it was probably the latter. The agreement itself contains very few direct requirements, allowing nations to interpret the terms independently and work toward various ill-defined goals. This problem led James Henson, the "father of global awareness of climate change" and an ex-NASA scientist, to condemn the agreement as a fraud. It lacks any enforcement mechanism, instead relying on nations voluntarily to reduce emissions. Assuming that countries will voluntarily subject themselves to emissions reductions brings into question the need for an international agreement in the first place. Why else would Exxon, Shell, Peabody, and other fossil-fuel companies traditionally hated by the environmental movement defend the accord? The excitement of many Paris agreement supporters following these statements exposes their naivete. People worldwide lauded the accord for including 195 countries, but the inclusion of so much of the developing and undeveloped world may have neutered the agreement. Including undeveloped nations in a global climate agreement presents a double bind. Either the outcome will stymie much-needed and fossil fuel-dependent development, or the agreement will not do much at all. The accord, again, took the latter approach by failing to make meaningful change. The agreement's already vague and unenforceable requirements for developed countries are even more diluted for lower-income countries. Interest in the agreement among many low-income countries likely stems from the $100 billion earmarked for payouts to assist in adaptation and mitigation. Yet even the source of these funds are up in the air, with international public pledges still well beneath the agreed-upon amount. If the money does materialize, the agreement fails to outline any monitoring to make sure funds are used appropriately or a mechanism for their transmission. If mitigating emissions is really the only goal, that money would probably be more effectually spent where sizable emissions are actually occurring — the developed world. Including the entire world in climate agreements is unnecessary and, as illustrated above, is likely to reduce their effectiveness. If an international accord does prove useful for addressing climate change, a better one would place responsibility for carbon emissions squarely in the lap of those who emitted them: large, developed countries. The United States and European Union alone are responsible for more than 50 percent of emissions since 1850. Thus, there's no reason to complicate negotiations with a worldwide agreement, nor to add to the developing world's biggest challenge of tackling poverty. If less-developed nations are considered at all, it should be to carve out room for their emissions to grow as they develop. The Trump administration's decision to leave the Paris agreement may have ramifications such as straining diplomatic relationships, but the claim that Trump is undoing the ultimate solution to global climate change cannot be justified by a plain reading of the agreement's text. Hand-wringing over the United States' exit fails to recognize that the Paris agreement is more of a symbolic vanity project for world diplomats than an actionable plan for addressing climate issues. Arthur R. Wardle is a research associate at Strata Policy, a public policy think tank in Logan, Utah. He wrote this for InsideSources.com.